Pastry, chocolate and competitive spirit! Cat Black: Tell me a bit about the start of your professional life. 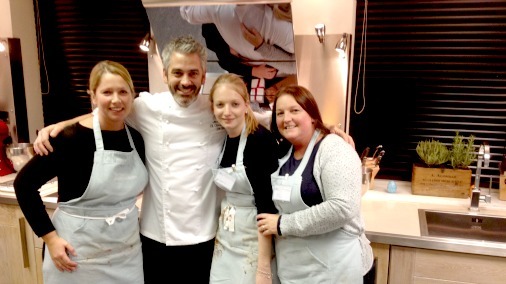 Mark Tilling: I pretty much knew I wanted to be a pastry chef from day one. I went on work experience in a local hotel from school. CB: Was anyone in the family doing it? Or was it just in you? MT: No, although both my nans were very good cooks. I learnt a bit from them and from my Mum. I don’t know why I wanted to be a chef. Probably the only thing I was good at! CB: I think if it is in you it is in you. MT: I think it is quite good that I knew so early what I wanted to be. So I did work experience at the Botley Grange Hotel in Hampshire. They did weddings and stuff, so I learnt there. From the work experience I got a weekend job. From there I went to catering college, and from there I went straight to London to the Lanesborough where I spent two years on pastry. It was great! It was hard work, it was long hours and rubbish pay! But you just did it, you wanted the experience, and you knew that money would come later. People now seem to think they will get money straight away. But it takes time, and if you are hard working it will come and you will be on good money. Two years was enough for me in London, then I needed to go. So I moved back home and started work. 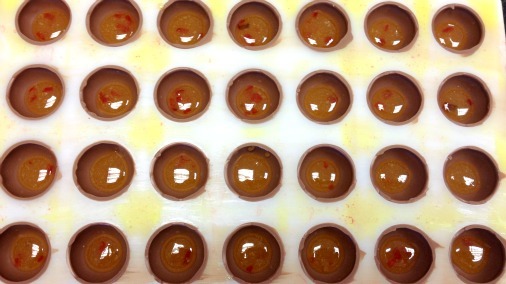 Saffron caramel lollies in the making. CB: You were always working in pastry departments? MT: Yes, I worked for the Hotel du Vin. I started in Winchester, then I went to open Bristol. That was a great opportunity as we had a lot of features in magazines, recipes and things. Then I returned to Winchester when I got married. I wanted a career change, and started up my own little patisserie attached to a deli in Winchester. CB: So you could be in charge. MT: Yes the owners let me do my thing. Then the opportunity came up to go to work for a chocolate company. At that stage I was really getting into chocolate, making chocolate wedding cakes. CB: I was about to ask, what was the catalyst that meant that you started to focus on chocolate rather than on pastry? 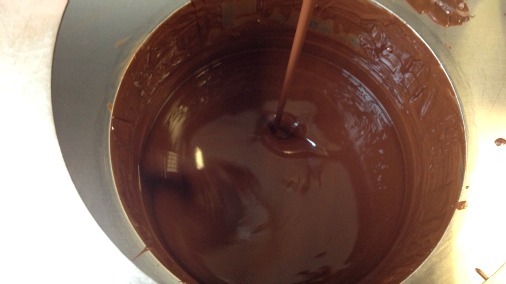 MT: I think chocolate is a fantastic medium and ingredient, there are just so many things that you can do with it. Truffles get a good dusting. CB: So when you went from patisserie, to working for a chocolate company, were you still doing any pastry? MT: Mainly doing chocolate, but chocolate wedding cakes as well. CB: So you were designing and making chocolates? MT: We had a whole range, we sold in Harvey Nichols and Liberty. It was a company called PaPaPaa, which is Ghanian for the best of the best. It is no longer around. We were doing a great job, lots of beautiful hand painted things for Easter and Valentines. Unfortunately the company went bust after a few years, and the main reason is they spent far too much on packaging. I learnt a big lesson from that, it doesn’t make sense to spend thousands on packaging, not to start with anyway. It was a shame, it was doing well and could have gone far. CB: When you left there did you go back to patisserie? MT: Yes, I went to the Lainston House Hotel in Winchester, they wanted a pastry chef. It was a while since I had done it, so it was a challenge, and that was great. I was there for about three years. From there I came here, to Squires. 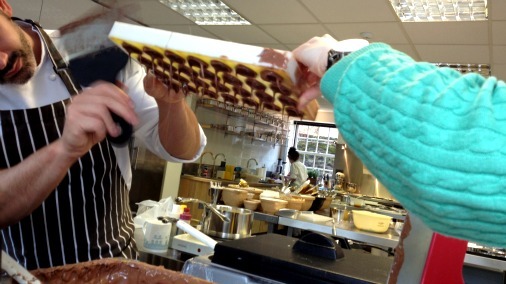 (Mark is resident head tutor for pastry and chocolate at Squires International School). Dark chocolate shells made life a little easier for some of the chocolates we made. CB: But chocolate took over at some point, when did the Masters happen and all that. 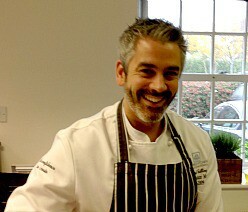 (Mark was UK Chocolate Master from 2006-2009). MT: When I was working for PaPaPaa, I got very friendly with Callebaut (who sponsor the World Chocolate Masters). I had already done some competitions through my career, through the hotels, and was getting gold medals across the board, which is always nice. I went on a few showpiece courses at Callebaut. CB: Are those held at their factory in Banbury? MT: Yes, then I decided to do a showpiece competition that was held in Bournemouth, and one of the judges from there asked me if I had ever thought about doing the Masters, because I got the gold medal, first time round, and best in class etc. I said I hadn’t. Callebaut then started to speak to me about it. I said I would wait two years, to see how it worked, and do it next time around. They tried to persuade me different. In the end they phoned me and said I must, that my entry would be late but they would put it through. CB: They really wanted you to do it! MT: In the end I did just to get them to shut up, sent in pictures of things I had done before, and recipes. And I was lucky enough to get through to the last four. So I went to that, which was very stressful. There were others taking part who had entered before. So I wasn’t expecting to win. 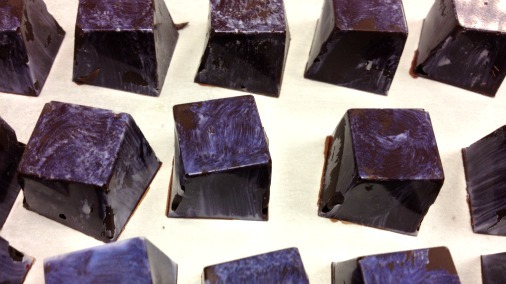 Earl Grey ganaches with iridescent glaze. CB: But that was the first time you got UK Chocolate Master? MT: Yeah. It was a big shock. CB: It is one thing training as a patissier and then going into chocolate. But what you have done is particularly technical. You have taken it to a greater degree than most in the country. MT: I love doing competitions because I find it gives me a challenge. CB: So it was competitive spirit. MT: Absolutely! And I feel that I need to do some now and again even now to keep my hand in. It gets your name out there still. CB: I do really understand being obsessed with the rigour of technique. MT: I am my worst critic as well. Even when my showpiece came fourth in the world I knew exactly what I would do to go to the next level, to take it that next step. (Mark was overall 7th in the 2009 Masters, but his showpiece was ranked 4th and the hat he decorated was also 4th). CB: It is all so highly technical, I was stunned to see how your desserts and your entremets are all weighed. Anything that is made in multiples must be exactly identical. MT: Yes, everything is weighed. You get a whole book of rules and regulations. The book gets thicker every time, because someone thinks of something that should be added to the list. CB: Did coming to Squires give you more time to work on Masters? MT:Yes, I had better hours, so I had the evening to work on the Masters. Squires were great at helping me with the publishing of the books we have to do for it, making moulds. 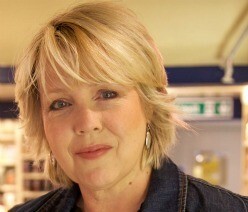 CB: Beverley Dutton is an amazing person for finding, supporting and promoting talented people. 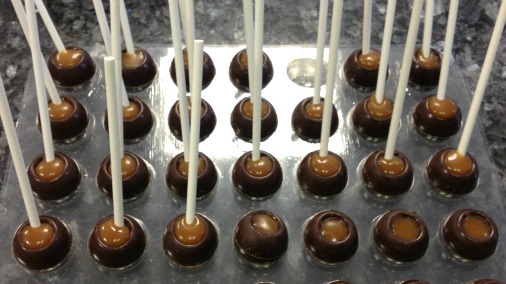 Caramel filled lollies are given patterned tops on transfer sheets. CB: How long have you been at Squires for? MT: About three and a half years. The longest job I have had! But the difference is that here every day is different, there are loads of new things coming up in the future. So I am always hearing of things I want to be involved in. The time goes really quickly because it is such an interesting company to work for. 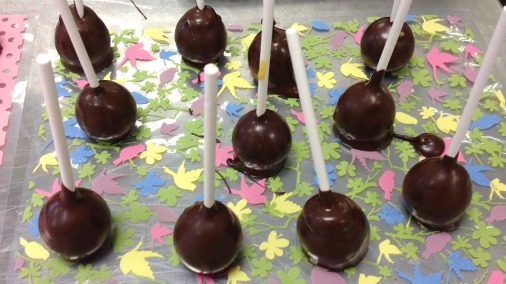 CB: There has been all the expansion and development of the teaching, and if you wanted to be working as a chocolatier you have an umbrella under which to do that too. In the period of time you have been working in chocolate, from my point of view the world of chocolate has changed so much. What have you seen? 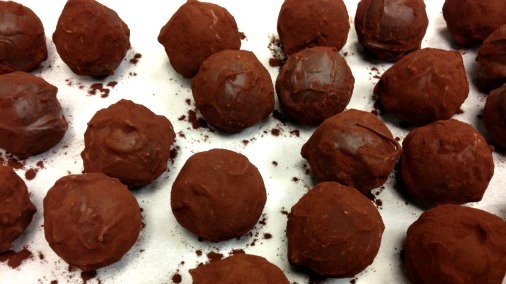 MT: I think today there are many more independent people making chocolate from scratch. It is closer to wine. There will be more tasting clubs, more individuality. Definitely now you see more origin bars, we want to know where it comes from. CB: People want to know about chocolate. MT: And the quality too. 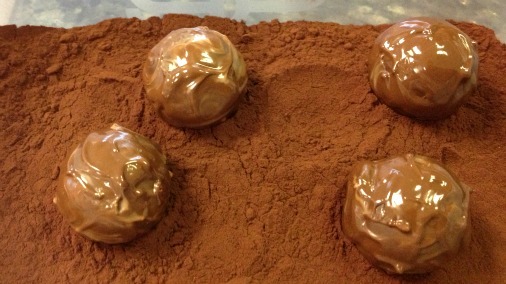 The rest of the saffron caramels got the truffle treatment. CB: And spreading the understanding that percentage is only part of the story, it doesn’t guarantee quality at all! MT: I always teach in my classes not to get hung up on using something in a recipe just related to the percentage. You may find a chocolate that has a stronger flavour with a lower percentage, or something may have high percentage but be a bad quality chocolate. It is about where it is grown too. That is to do with education, I think we are starting to get these messages over to the public. CB: You were telling me earlier that in the last few years you have been able to go to Ghana and to Brazil to the plantations. As a Callebaut ambassador you are restricted to Barry Callebaut chocolate, but you are able to go and see the process right from the start, see the beans, taste them, seeing how it is done so you have a really full understanding of what you are using. MT: Yes, two fantastic trips! Very different countries, the way they produce, the way they dry. In Africa, a very poor country, they just dry outside on mats. In Brazil they dry on the top of their barns with roofs that they can take on an off, and they have machines, they seem to have a little bit more. In Ghana they are very small family run farms, a couple of acres, or an acre. In Brazil they are family run but a bit bigger. Two very different, but it was great to see both. CB: Having seen this increased focus on flavour profiles, where do you think chocolate is going to go now? 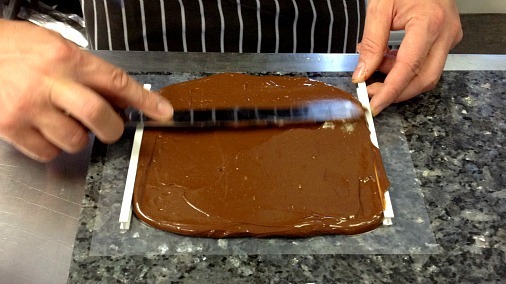 MT: I think that people now are making chocolate from scratch, small companies. The origins, single plantation chocolates on a bigger scale will come through. Cocoa Barry do one now. Down to flavours, I don’t think it is going to go too mad or too complicated. You see that in competition, when people go too mad, with three flavours in one chocolate, it doesn’t work. Chocolates are small, you can’t get all the flavours. I prefer something like a very simple raspberry ganache, with fine ingredients, made with good quality chocolate, then it is an honour to eat something like that. 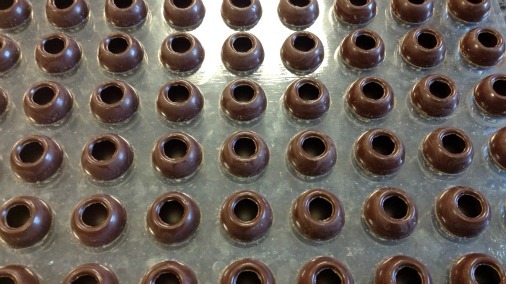 Hazelnut pralines hiding amongst their chocolate coatings. CB: It is interesting because I have tasted some really odd combinations in my travels, and there are very few people who can juggle an eccentric idea and come out succeeding. Some of them are a bit off the wall. There are people who can manage it though. What about you personally, what are you doing next? MT: Obviously the school is really taking off (Squires Kitchen International School). Patisserie is going mad here in the UK, which has been part of our success. I get a lot of people coming back now on courses, which shows me I am doing something right! It is great that I travel abroad now a lot taking what we do here. I am in Barcelona next. CB: Squires is present now at cake exhibitions around the world, so you go, under the Squires umbrella, and bring some chocolate too? MT: Yes, it could be either chocolate and sugar, or a bit of everything really. I have done some teaching in Italy. CB: And you were there in Tours, when I came out to write about it. I understand that you went down well in the Far East. I seem to remember some anecdote about you getting a lot of marriage proposals! MT: Oh yes! That was in Malaysia. We have our franchise school there. Mostly I love teaching, I love giving my skills to other people. Mark helps a student tip out a mould to create tempered domed shells. 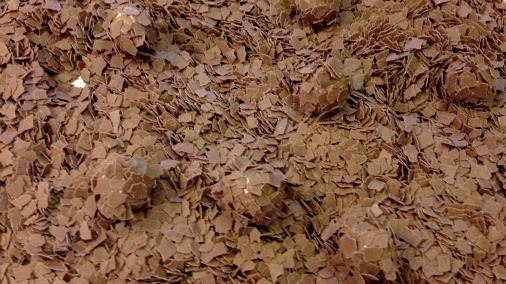 CB: On that note, you are still very involved in the Chocolate Masters. You helped the last UK entrant, and you have made a much tighter team for this year’s competition. 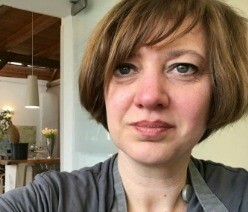 Ruth Hinks from Cocoa Black is current UK Master heading for Paris this autumn. So you are able to mentor the competition. MT: I judge the UK finals. I love helping there, they are representing your country, like I did, and you want them to do the best they can. CB: I remember you talking about the Junior Masters, as being something you were involved in, trying to develop that so that more people were coming through. MT: Yes, we did the first one in 2012, two weeks before the adult one. It was very low key. Next time it will be bigger. There are some good people out there. They don’t always have time, because we know how busy hotels and restaurants are. But it is about educating people, knowing who people are, then we can build them up and grow them into a good chocolatier. Then we can enter them into the UK finals. Our quality in the UK has always been good, but still needs improving. CB: France, for example, our closest neighbour, has this incredibly established system of apprenticeship with an aim to being a master chocolatier or patissier, by gaining your Maitre Oeuvrier de France. If that is visible around you, you aspire to it. MT: Exactly, so we need to educate. It is currently difficult to get people to enter the finals. Spreading ganache to an even thickness for the hand cut and dipped gingerbread chocolates. .
CB: So you need to go to places like Westminster Catering College, and make sure people know about it right from the start, so they can aim for it. All regular chefs know about Michelin stars, for better or worse, so the sixteen year olds scrubbing the floors, can be thinking one day I want to be a Michelin starred chef. You want the pastry equivalent to be dreaming of being a chocolate master. MT: I think people are beginning to realise the great skill of a pastry chef. CB: How many times have I seen on Great British Menu and shows like that how much some chefs struggle with pastry. MT: Absolutely. You are either a pastry chef or you are not. You are either a kitchen chef or you are not. I couldn’t go in a kitchen. Obviously I have done it at college, but I couldn’t go and do it. CB: Apart from chocolate are you a foodie? MT: Yeah I love food. When my wife and I go on holiday it is the norm now to see what chocolate shops are there and what patisseries are there. But having said that, I couldn’t go home now and start making chocolates, making patisserie. I tend not to, unless I am having people around. It is my job. Mark's pride and joy the tempering machine in action. CB: But also when you do make things for people they expect it to be really stellar! MT: Yes, and whenever I go to anyone’s house there is always a phone call saying Mark, you can make the dessert, because they don’t want to make me a dessert! CB: What is your desert island chocolate? MT: It is really difficult as there is so much that I haven’t had the chance to taste, that I want to taste. I do love the single origin, the Madifirolo, the one from Cocoa Barry. I love it for its fruity passion fruit and citrusy flavour. But there are so many I haven’t tasted!